I'm sure you are all excited to Experience the famous Melt-In-Your-Mouth, Hot Original Glazed Doughnuts of Krispy Kreme. The long wait will soon be over! 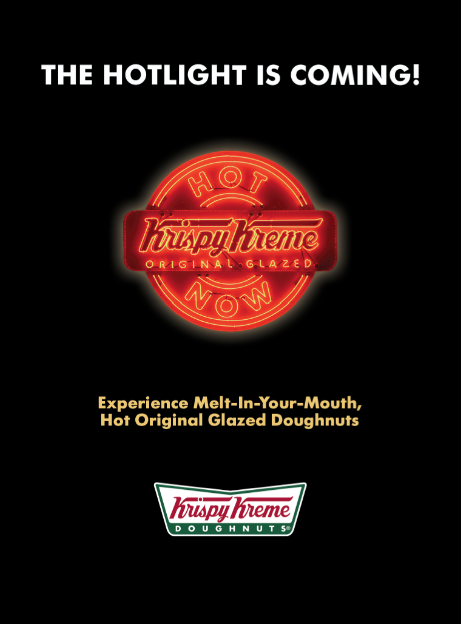 Krispy Kreme opens on October 20,2012 at 9AM in SM City Annex and at 12noon in Abreeza Mall . Make sure to mark your calendars! To complete the Krispy Kreme experience for Davaoeños, its Abreeza Mall branch will feature the Baked Kitchen, where the brand’s Baked Creations are freshly rolled out every day. Meanwhile, its outlet at The Annex at SM City Davao—its first 4th drive-thru store in the country set to operate in its own extended hours from 6am to 1am—will boast of the Doughnut Factory, where thousands of everyone’s much-loved Original Glazed Doughnuts are produced daily. Wait! Here's more... True to the Krispy Kreme tradition, the first 100 customers (valid for dine-in/take out and drive-thru, so actually it is first 200 customers-in SM Annex) to ring the cash register will be receiving supplies of the brand’s Original Glazed Doughnuts and Signature Coffee. For those coming from neighbouring cities of Davao, who's also part of the first 100 customers, get to enjoy these goodies like you are first in line. The eight (8) neighboring cities in Mindanao included in this promo are Davao Oriental, Davao del Norte, Davao del Sur, Zamboanga del Norte, Agusan del Norte, General Santos, Lanao del Norte, and Cotabato City. Be sure to be among the first 100 on the 20th. May the odds be ever in your favor. See you there!